Freescale officially launched their newest CPUs today. The i.MX50 family is getting a couple new members, and they will be integrating a new controller chip that can drive an E-ink screen. The i.MX50 family of chips is based on a Cortex A8 CPU, with a base speed of 800MHz and a NEON co-processor. Two of the chips, the 507 and 508, will have have the new support for E-ink screens integrated into the chip. They will also be keeping support for LCD screens, so what we have here is a chip that could drive a dual screen tablet (like the mythical Amazon tablet I mentioned yesterday). It's possible to have the same features by using multiple chips, but the advantage here is two-fold: cost and time-to-market. Combining several components into one reduces cost and the complexity of the device. It also takes less time to design and troubleshoot a new gadget. Update: A commenter pointed out that I neglected to mention that the Kobo Touch uses the 508 chip. Whoops. While I'm on the subject, Freescale also provided chips for the K3, Kobo Wifi, txtr Reader, Irex DR800 and many others. They've been in the ebook reader market for a long time. 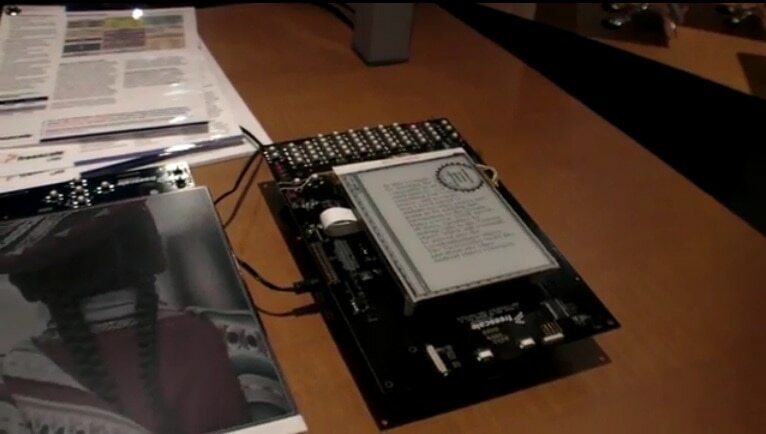 In case you're interested, Charbax of Armdevices.net got an early look at the new prototype platform that Freescale showed off which they've designed specifically for ebook readers. The Kobo eReader Touch uses the i.MX508. Its integrated EInk screen controller seems to be competitively fast. Yes, that’s why I said officially launched. Though you’re right to point out that I forgot to mention the Kobo Touch, Kindle, and other ebook readers using a Freescale CPU.